I had a chance to go back to Marukai on Ward yesterday and I was able to find more bento boxes and I went kinda… crazy. I bought 7, yes, seven new bento boxes. None of them were more than $1.99, which is of course why I went so shopping crazy. I actually found the “putifresh” boxes that I’ve been looking at on eBay for quite some time and so it’s a good thing I went back and found them. I took pictures, but my domain is down for maintenance atm, which is why none of the past bento pictures work. I’ll edit this post to put the pictures in when my site is back up. 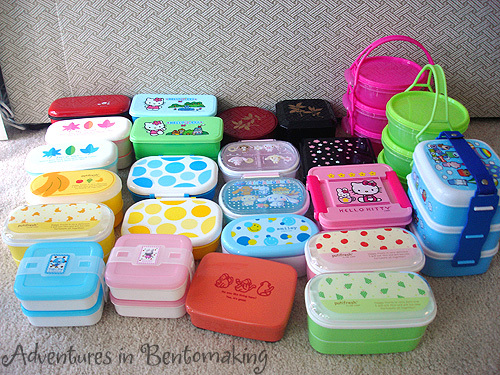 I took a great picture of all of my bento boxes. I have 24!! I think I can cool it on the box buying for now. 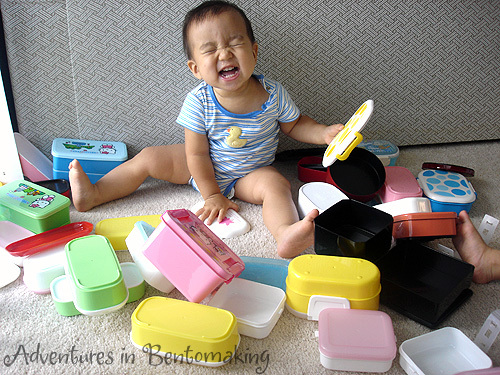 It was very difficult to get the collection photo as Buddy apparently loves bento boxes. I had lined them all up and was about to snap the photo when he took a flying leap into the midst of them and started going crazy flipping them all over the place. +_+ I tried this several more times but couldn’t get the picture until he was distracted elsewhere. I also found some great new accessories that weren’t there the first time I went, so obviously new inventory comes in all the time. I found those super cute animal soy sauce bottles I see on eBay all the time, the green/yellow/pink sushi grass, and some nice bento cloths to wrap my boxes in. 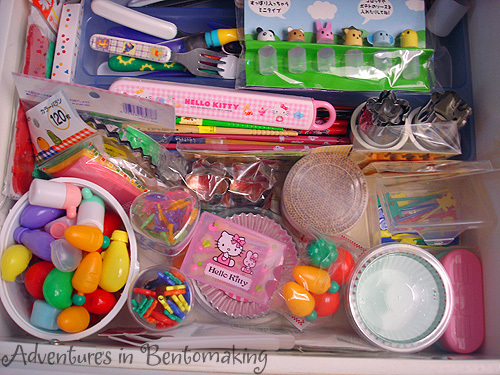 I cleaned out a drawer and arranged all my bento accessories nicely! *GASP* I have chosen to ignore that suggestion for it’s ridiculousness. All joking aside, he said it’s too soon to do any kind of testing, so I’m going back next week if it still hurts.